WARNING: The following article contains minor spoilers for the TVB drama My Ages Apart, ending January 12, 2018. My Ages Apart <誇世代> is kind of blowing everyone’s minds, and we don’t know if it’s a good thing or not. 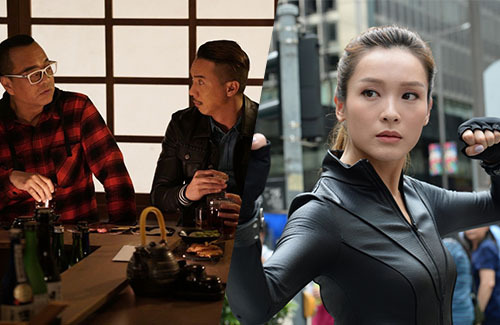 The 50-episode TVB anniversary drama My Ages Apart, headlined by Bobby Au-yeung (歐陽震華), Moses Chan (陳豪), and Louis Cheung (張繼聰), is many genres in one. On the one hand, it talks about people from different generations swapping bodies, where they have to briefly learn how to live in each other’s worlds. On the other hand, it is also a revenge story, where a man marries into a powerful family to destroy them from the inside. But these netizens are starting to retract their words. More surprises were dropped in My Ages Apart’s final week of broadcast, which ends this Friday. A strange but interesting shift in storytelling has completely changed the course of events. Subplots like a taxi that travels to the future and the butterfly effect were added. There’s even a segment about zombies inspired by The Walking Dead. It’s like viewers were watching an online fiction story being brought to life. Some netizens appreciated the change, calling it creative. Moses Chan, who portrays “Mike”, responded to questions by confused netizens in an interview conducted yesterday. He admitted that, like the netizens, he too was shocked at the ending sequence for My Ages Apart. Just watched the last ep . I would say it’s one of the best drama I’ve watched in recent years . The drama is like a rollercoaster ride with multiple genres in one drama . Hope this drama gets some awards in the upcoming anniversary awards !! @ivan same here! Always like Moses but he was def. Awesome as Mike!!! Can’t wait to watch the ending tonight!!!! Bobby and Maggie please!!!! @ivan I’m impressed with Moses though I normally don’t like him much lately. He definitely has great chemistry with Ali and his acting in the last few episodes were TV king worthy. I like Ali as Paris though I’ve never liked her previously and Moses Bobby and Louis were a great team. Hope this drama gets some awards. Will be re-watching this for sure. Its crazy insane eccentric at times trying my patience but every episode is funny or dramatic or touching. Love Walking. Love his relationships with his sisters. Never guessed the ending. And the i love hk message. Ali lee impresses especially the hospital scene. Love the guest stars and i guessed the last one. Never thought 50 eps in and its still funny and touching. Would have like an ending for two sub stories tho. And shldve been liza wang as sheung hing duen. Witty and touching. My god tvb what happened? You just made a classic. @funnlim that’s what I said too in another post. Helen Ma doesn’t quite cut it, Liza would have been awesome as Sheung Heng Duen and this would have been a classic series. Enjoyed every crazy episode save for ep 49 cos Grace Chan was in it bleh! I saw shades of Wong Tai Mui from COD. Funny how I thought this drama would be a drag at 50 eps but turns out I can’t wait to catch it every night. The guest stars were a bonus and it was fun to see who would pop up unexpectedly. And of course the spoofs were a lot of fun to watch. @funnlim Which 2 substories? I would have liked them to address who Bobby finally ended up with and if Bao Pao reconciled with his dad. The only other thing I hated was the final twist regarding the youngest sis. They should just have left her as the daughter of Gilbert and eldest sis. It really wasn’t necessary for Walking and her to end up together. @passingby he definitely doesn’t end up with Kristal because she wasn’t with the family anymore, and she wasn’t with him when he got the award, neither did she thank him when she won an award. So Bobby either got with Maggie， or just continued taking care of Maggie’s son. And ah Pau did forgive his dad, because when he won an award he thanked his aunt, mom and dad. @passingby another good point regarding Bobby would be his daughter lived with Kristal, and he did mention he hasn’t really seen her for a long time, which means he doesn’t live with his daughter or Kristal anymore. Plus in two futures it clearly shows Bobby picked Maggie. And remember he clearly made up his mind and was going to tell Kristal? But he just didn’t get to. I’m pretty sure he eventually did. @abcd The future where Maggie’s son called Bobby dad didn’t come true so it’s anybody’s guess who he ended up with. But kristal doesn’t deserve to have him back. As for Maggie they don’t seem to have romantic feelings for each other, it just feels like good friends. On another note I didn’t like the 7th sister twist at the end cos it just feels icky to know that they still have romantic feelings for each other even though they had found out that they were related. Major loophole is why Mike didn’t know that Walking didn’t die till right at the end. Also the timeline didn’t quite fit. It took Mike about half a year or so to give birth to the twins but the others like Kristal Bobby Walking and Pau seemed to have achieved so much during that time frame. As usual the ending felt rushed. @passingby whether bobby ends up with Maggie since last scene was coy and dis they find the real daughter. Walking deserves his happy ending and I already guessed they are not related the moment they are exposed as bro-sis. I was a bit tired with Katy kung character whose always scheming but I love her scene with walking when walking explained what he will do as her loving big brother. You know thos series has some amazing dialogue. Its a mix bag of everything and every time I feel its going nowhere something pulls me back in. And I am talking about every episode. Something good happens every episode. @funnlim yes it’s kind of sad about the real daughter. Just finished and loved it!!! 50 episode but doesnt feel that long as its wicked funny and the cast was awesome! Walking deserved the happy ending and I guessed she wasn’t the real niece or it’ll be too weird as they still had feeling for each other. Moses was awesome, Bobby was perfect as always and Louis really is a good actor. I love their 3 friendship and the message it sent at the end. Totally unexpected!!!! Sad to see the rating being so low but I hope it will get some awards!!! I also really liked Ali as Paris! Really see her character grow! She did a good job! At least it is not a drama that after watching for over 50 episodes and it just ended as if we didn’t watch from the beginning. Glad that after exchanging souls and other roller coaster and finally we felt satisfied watching the last episode. The imitation of the walking dead was something surprise. i would like to see Moses play more villains. the last episode was good though felt somewhat rushed; but definitly didnt appreciate the sped up narrative at the very end. also charmaine sheh appearing was very surprising lol. I must say, I quite enjoyed this drama. Credit where credit is due, they actually took chances creatively. Whether it all resonated with the audience or not, at least they tried it out. I can see how people like my parents may not like this drama, because it steps a bit outside the formulaic nature of most TVB shows, but I thought it was well done. The characters were great. Definitely the highlight was Moses and Ali IMO. I think Moses stole each scene he was in. The one thing I didn’t like or get was the 180 switch in personality with Bobby’s daughter, and then 180 switch back in the end the wrap everything up. At first, I was suspecting she was in a body swap mini plot herself, but turns out she’s just a bad person. And that kind of went against the first half of her character, so that didn’t make any sense to me. Oh well, it was only a minor annoyance as she was a minor character anyways. I enjoyed & watched the entire 50 episodes. Although it ended in abit rush but it ended well. I have to agree that Moses did well in his role, the villainess side just came out naturally despite being funny though. Ali Lee acting improved and she deserved the best actress award in Malaysia. I believe her chances of winning in HK were slim. Wonder when will Jaynestar post a voting post for us to vote our favourite artist.